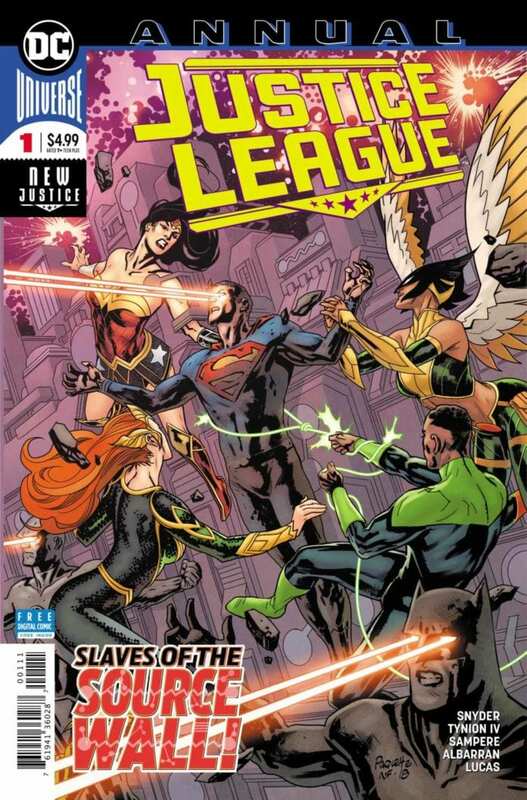 Review: JUSTICE LEAGUE ANNUAL #1 - The End of the Multiverse? A cataclysmic, world-altering plot that contains all of the punch from legendary DC stories of the past. After the huge success of DC Comics’ Dark Nights: Metal series, it’s hard to imagine the publisher reaching new heights so soon. But JUSTICE LEAGUE ANNUAL #1 goes above and beyond by crafting a catastrophe that threatens to destroy the entire DC multiverse. The legendary writers Scott Snyder and James T. Tynion IV have created a plot that flows seamlessly from the discovery of the Dark Multiverse in the Metal event. 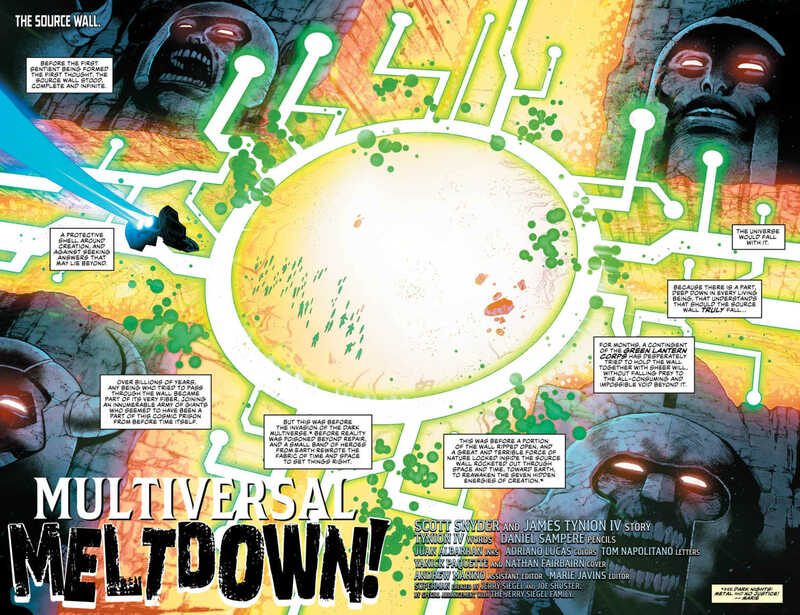 After recovering from the event’s final battle against the evil Barbatos, the Justice League encounters The Source Wall, a colossal structure said to house the source of all reality and keep the multiverse from collapsing. The heroes realize the fight with Barbatos accidentally ripped a hole in the Wall and must find a way to fix the breach. Snyder and Tynion are no slouches when it comes to reinvigorating older concepts from DC Comics’ mythology, which is why it’s wonderful to see how well they handled the Wall and the “Source” within. Fans of legendary comic creators Chris Claremont, Walt Simonson and the late Jack Kirby can rest easy knowing these men’s creation grips readers with its awesome majesty. And the manner in which they tie it into the present threat of a multiversal collapse embodies the excitement of past stories such as Crisis on Infinite Earths and other comic world-shaking events. What’s also great about this story is that it places the focus on characters who rarely have the opportunity to shine in Justice League comics. Instead of placing the traditionally heavy emphasis on the “trinity” (Superman, Batman and Wonder Woman), the writers give Kendra Saunders, a.k.a. 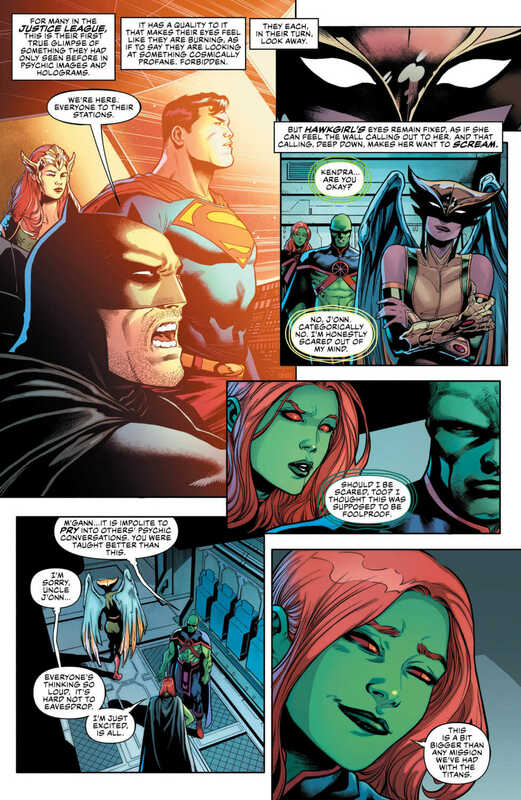 Hawkgirl, most of the attention. The story effectively highlights her struggle with an important decision: retreat from the Wall or take part in a plan that may cost her her life. Yanick Paquette and Nathan Fairbairn have crafted a cover evoking feelings that are indicative of the wild story to come, one full of fear, confusion and action. The heroes struggling against each other also exemplifies the utter chaos of the Source Wall. Daniel Sampere, Juan Albarran, Adriano Lucas and Tom Napolitano assemble fantastic artwork in this issue. Sampere illustrates each character with incredible precision, showcasing their anxieties. Tom Napolitano adds to this effect through the use of well-placed bold lettering to further emphasize the overall tension. Lucas and Albarran capitalize on the excitement of the story with a wide spectrum of colors, ranging from the heroes’ solid shades to the bright hues of the Source Wall. The creative minds at DC Comics were wise in tying this introductory story into the popular Metal event while simultaneously hearkening back to world-building of the past. It’ll be great to see where they take the series from here. Do you like the direction JUSTICE LEAGUE ANNUAL #1 is headed? Let us know in the comments below!